On Saturday, July 26, 2014 at 10 a.m., Lowe’s has a FREE Kids Build and Grow Clinic where kids will be able to make a FREE Turbo Taco Truck! These workshops fill up quickly, so register your kids now! In addition to making the free project, your child will receive a FREE apron, goggles, and more. 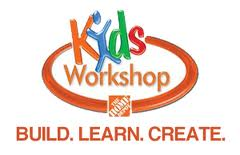 On Saturday, August 2, 2014 from 9 a.m. – Noon, Home Depot has a Free Kids Workshop to build a FREE Mini-Crate Pencil Holder. Home Depot asks you to register your children so they can get an idea of how many projects they need at each location. However, if you don’t register you can still show up to do the free project. In addition to receiving a free project, kids will also get a free certificate of achievement, apron, and commemorative pin.